I love this. It’s really something that has a rustic vintage quality to it and I see myself enjoying this with my kids for years to come. 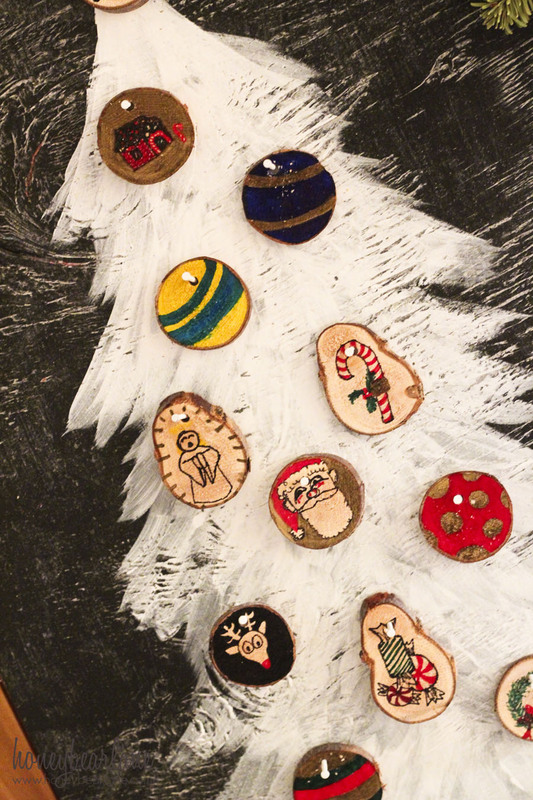 I remember as a kid we had this felt advent calendar that was falling apart but I always loved it. I have no idea where we even got it. I wanted to have something like that for my kids to remember and have fun with. 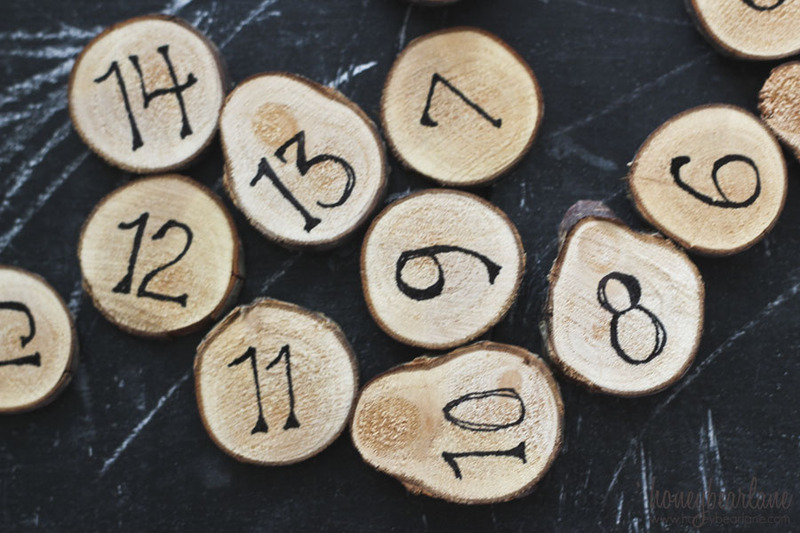 So each number gets flipped over as the day passes to reveal a fun picture or ‘tree ornament’. I was also really happy to find a use for this piece of plywood that I’d painted with chalkboard paint a long time ago for another project that I didn’t end up using. But it was weathered with chalk which added such a cool effect to it. 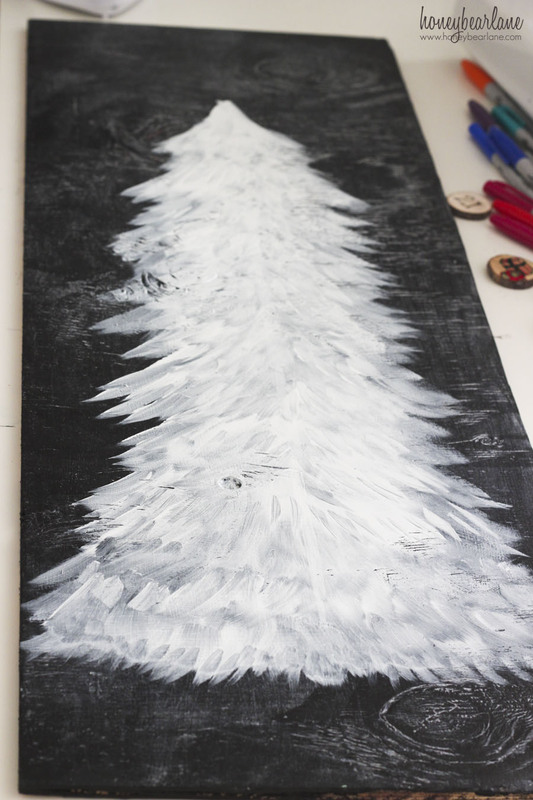 To paint the tree, I just painted a white line down the middle and then used a medium flat brush to brush strokes down the sides of the center line. It was super easy to do and I think it turned out so pretty. I could have been happy with just this. 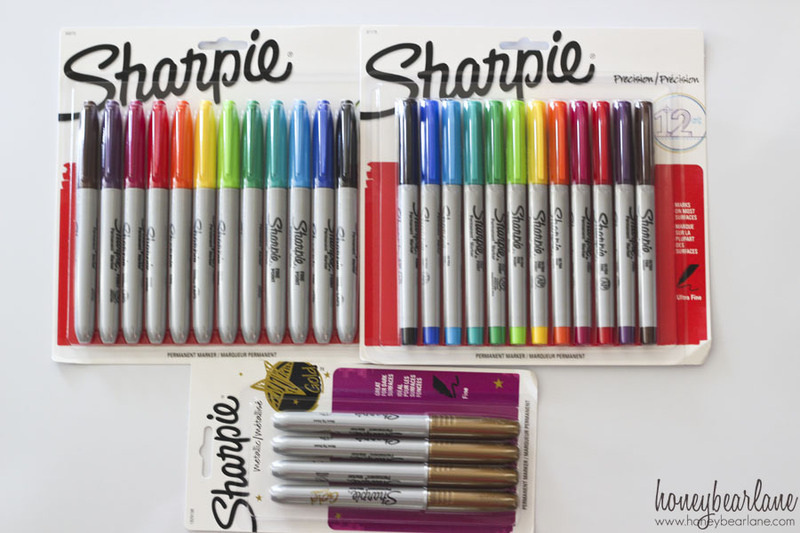 I recently visited Staples and bought myself several shiny new packages of Sharpie markers. I got the assorted colors, the fine tip assorted colors, and a pack of metallic gold. Sigh…I love new Sharpies. It’s the little things in life, right? I used the black fine tip Sharpie to draw on the numbers 1-25 in my best fancy handwriting. Then on the other side was the fun part. 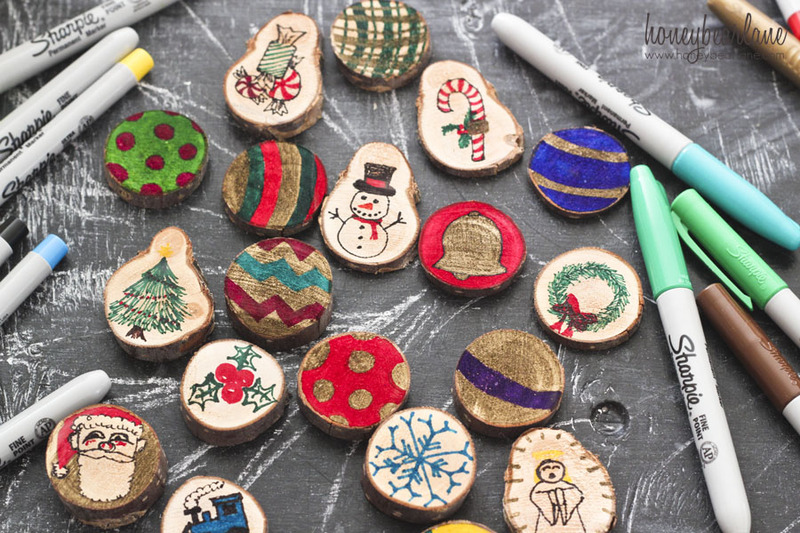 I used all the other Sharpies (fine and regular tip) to draw little pictures and designs on the backs of the numbered circles. I’m not a great artist, but most of them turned out pretty well. And it’s so personal, it makes it more special. After that, all I needed to do was to drill holes in the wooden circles and pound some nails into the board. First I drilled holes a little larger than the nailhead in each circle. Then I arranged them carefully on the board and then pounded the nails in. Very easy. My nails also happened to be white already so they blended in with the white tree. This was just one of those projects that just came together so easily. I really love how this turned out and had a fun time making it! The best kind of projects. And of course I couldn’t have done it without my wonderful Sharpies. I definitely recommend that you visit Staples and purchase the 12-count multi colored pack of Sharpies and the Sharpie Metallic Assorted 4 count pack. There are so many things you can make with them! I got them for such a great deal too–$6 for the 12 markers and less than $4 for the metallic ones! You can visit them on Facebook, Twitter, Pinterest, and Instagram. I love this!!! 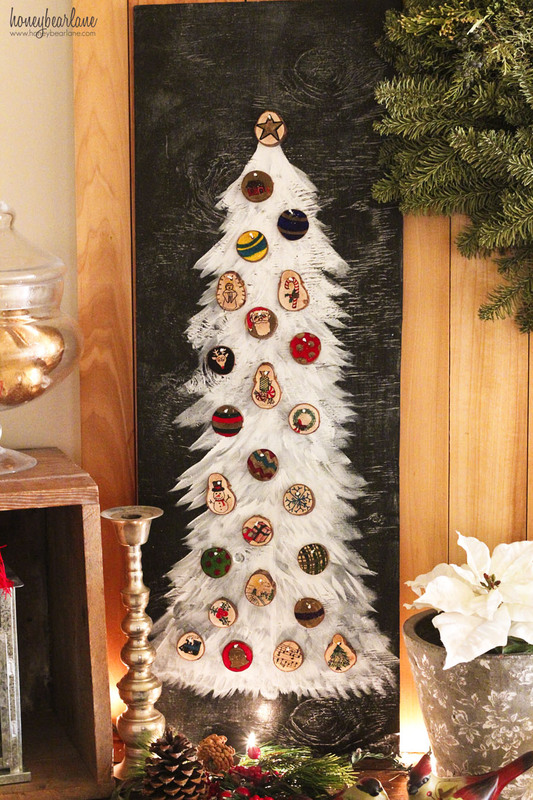 I too am a huge rustic wood fan and I just may need to make one of these! Well done!! do it–it’s so fun and easy! I just saw this on my Pinterest feed and had to stop by and tell you how beautiful it is. 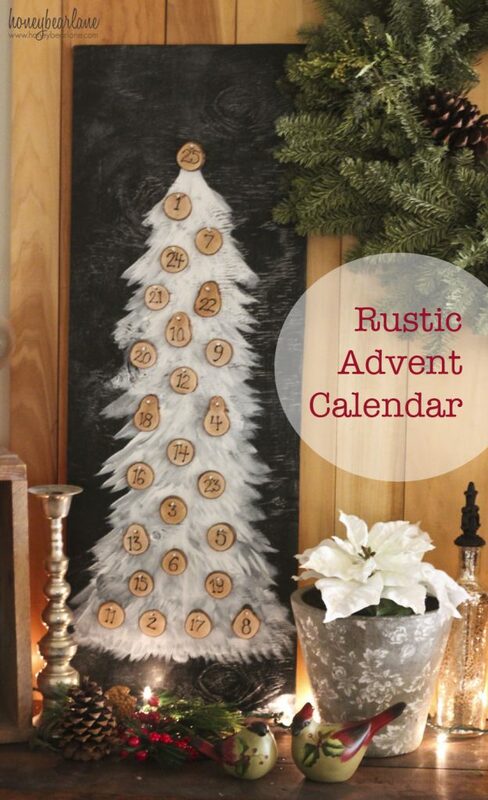 I love how you used the wood for your Advent Calendar and pretty impressive with free handing everything. I just did and posted my first Advent Calendar this year and was excited to start using it with my kids. This calendar is something that you’ll be able to use for years to come. Pinned!! Do you have a honey bear lane Facebook account? I made sure to follow you on all media’s! Wow thanks so much Courtney!! I love this project also. Advent calendars are so fun right? I do have a Facebook–it’s facebook.com/honeybearlane. Thanks again and happy holidays!